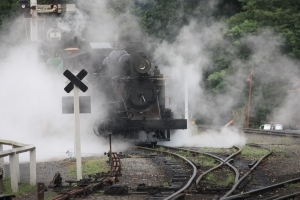 As well as various destinations throughout the country, steam trains can also transport pensioners back to their childhood as soon as they step on board. Steam excursions, with original locomotives, rolling stock and curling, cardboard sandwiches are now widely available, and for many pensioners, poking their head out of a window and getting a face full of soot is one of the most exhilarating and evocative experiences they can enjoy. To convince other passengers that you are a true aficionado, you should use the phrase ‘Stanier’s immortal Black Five’ as often as possible, and if you are intent on recreating your days of travelling to school by train, setting fire to your compartment and throwing the guard off the train will instantly bring those memories flooding back. Numerous steam preservation societies can also be found across the UK, and these are always happy to welcome volunteers to act as wheel-tappers, signalmen and even Lord Beeching stand-ins who are periodically tied to the railway tracks and run over by a small tank engine with a Belpaire firebox. Steam train memorabilia is also a popular interest among pensioners, with regular auctions of stations signs, LNER uniforms, railway posters and authentic bottled steam among the thousands of items for sale.